Staff are our most precious and expensive resource, so it is vital that they are given every opportunity to grow and thrive professionally. At Archway Learning Trust we have long subscribed to the view that genuine school improvement can only take place when there is a real commitment to staff development and learning. 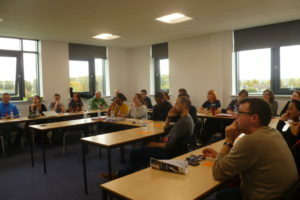 To this end we have numerous professional learning opportunities at the Trust which include courses for newly and recently qualified staff, middle leaders and those with aspirations for headship, alongside the ability to undertake research through MAs, research projects and the list goes on and on. Our staff body is critical to the success of our Trust and we invest heavily in all staff. Dedicated training time is set aside weekly. During this training time staff have the opportunity to work alongside colleagues from other academies in the Trust, spend time with their own peers and mentors and also visit those from other Trusts and networks. This training time is complemented by a weekly Teach Meet where the best ideas in teaching and learning are shared and discussed. The showpiece events of our training calendar are our Festivals of Learning. These are opportunities for everyone across the Trust to learn together. We are inspired by national and international speakers to become truly outstanding teachers and support staff in order that our students can be as successful as possible, and go into society as fully contributing members of our communities, helping to make the world a better place.